Mr. Chen Li, male, Han ethnic, was born in June 1958 in Zizhong, Sichuan Province. He is research librarian and Ph. D advisor. He worked in the countryside in 1976. He studied in History Department of Sichuan University from February 1978 to January 1988, and got his bachelor degree, master degree and doctor degree successively. 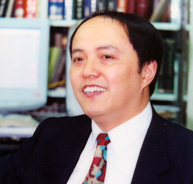 He worked in Sichuan University Library from 1988 to 2001, and has successively held the posts of deputy director and director of Sichuan University Library. He was transferred to the National Library of China (NLC) in 2001, and served as the NLC deputy director from February 2001 to December 2015. He is appointed as the NLC Executive Deputy Director (Director-General Level) in December 2015. He joined China Democratic League in 1994. Mr. Chen Li is a member of the 10th and the 11th Central Committee of China Democratic League, and a member of the 11th and the 12th National Committee of Chinese People's Political Consultative Conference (CPPCC).